5,200 U.S. troops are heading to Mexico border! Please see update: “Operation Faithful Patriot: more than 5,200 U.S. troops deployed to secure US-Mexico border will be armed“. President Donald John Trump means what he says. Last Thursday, the President said he was “bringing out the military” to guard America’s southern border against the caravan hordes of mainly young, military-age, male migrants invaders from Honduras and Guatemala trekking through Mexico on foot and by train, bus, and truck toward the U.S. border. 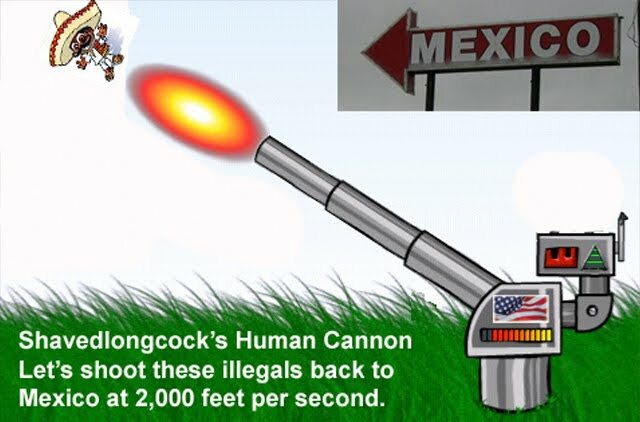 The invading horde now number more than 14,000. Reuters reported less than an hour agao that the U.S. military has received a request from the Department of Homeland Security (DHS) for active-duty troops to be deployed to the U.S.-Mexico border. Speaking to Reuters on condition of anonymity, a Trump administration official said the military is examining the request that could require deploying between 800 and 1,000 active-duty troops to the border to assist with logistics and infrastructure, but would not be involved in “law enforcement” activities, something that would be prohibited by a federal law dating to the 1870s. Note: What Reuters means is the Posse Comitatus Act of 1878. That law restricts the use of the Army and other main branches of the military for civilian law enforcement on U.S. soil unless specifically authorized by Congress. But the military can provide support services to law enforcement and has done so on occasion since the 1980s. However, there are specific statutes that authorize the president to deploy troops within the United States for riot control or relief efforts after natural disasters. There are already 2,100 unarmed National Guard troops along the borders of Texas, New Mexico, Arizona and California. In April, frustrated by lack of progress on the wall, President Trump had ordered them sent to the border to help secure the border in the four southwestern states. Also in April, Trump had raised the prospect of sending active-duty military forces to the border to block illegal immigration border-crossers, raising questions in Congress and among legal experts about troop deployments on American soil. 800 to 1,000 troops are a good beginning, but not enough. President Trump has already called the “migrant” invasion a national emergency. By declaring martial law along the border, he can justify the deployment of troops for riot control. This entry was posted in conspiracy, DHS, Donald Trump, Honduras-Guatemala 'caravan' invasion, illegal immigration, Liberals/Democrats/Left, Military, United States, US Presidents and tagged Posse Comitatus Act of 1878. Bookmark the permalink. Trump told the people at the WI rally that NONE of these invaders would be allowed to enter the U.S., and that we would be very impressed with his temporary version of a wall. Also, legal commentators are saying that he can even send troops into Mexico to stop them. We shall see. Trump is very serious about protecting us. Protecting our environment, flora ,fauna, and the citizens of the United States. Thank you President Trump. ALELUYA, this is the best news I’ve heard about the invading plebeians. No doubt about it, POTUS MEANS BUSINESS. I can picture him when he was a private citizen conducting business at the Trump Tower. The same technology [BAE Systems] that eliminated the Somali pirates from overtaking shipping lanes, can be used at the US/Mexico border. We have NO obligation to accept these invaders onto our soil. This is their primary intent. If they can’t get enough to do this then they should be pulled off all the idiotic foreign wars and sent home. If these invaders are coming from Guatemala who’s there to say no to Cuba/Castro to send another invasion via Cuba/Key West, the dry foot/wet foot is no longer in place. CUBA/CASTRO is the slithering snake. Sorry poor downtrodden healthy military aged men future democrat freeloader voter caravans Hussein Hopenchange is no longer in office to welcome you. Contact Nancy Pelousy for free foot washing. Here’s a nice touch. American (USA) trucking company hauling invaders. I wonder what they’re paying them? Thank God for coyotes -they’re waiting for the slaughter! It is quite clear that Bergoglio is behind this ‘socialist invasion’ with the help of his other globalist operatives. American citizens are exhausted with this political BS. We either operate by the ‘rule of law’ or we devolve into a ‘banana republic’. I vote for the former which is lasting and give my children a future based on solid rock. As our British friends would say, it’s about bloody time. How many soldiers per “Troop”? Google’s drop-down-menus of similar questions said anywhere from 14-50 soldiers Per Troop, to 250 soldiers Per Troop. Big Difference in numbers. Is there a legit number? If 50 soldiers Per Troop x 800 Troops (AP) = 40,000 men. That MIGHT work: 40,000 unarmed (=worthless) soldiers to “stare down” 14,000 invaders. Great post & comments everyone. I feel your pain & frustration.